This Chow Chow Curry is a dry curry made with out Cococnut and by adding onions. It is a tasty curry that goes well with Sambar, Rasam and thogayal varities. I have already posted Chow chow curry (No onion and with Coconut), Click here to get the recipe. 1) Heat oil in a kadai and add Mustard seeds to crackle then add Red chillies. 2) Add urad dal and fry till light brown. Then add onion and fry till light brown. 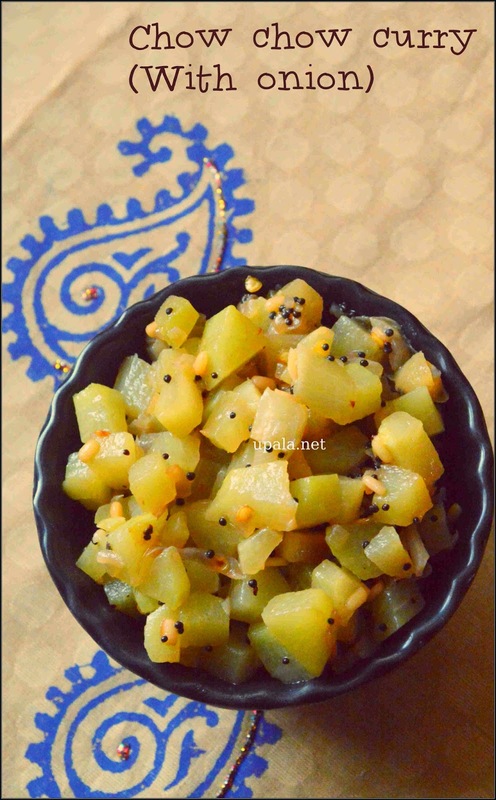 3) Add Chowchow/Chayote, Salt and mix well. Sprinkle some water and close it with a lid to cook in medium flame. 4) After chow chow gets cooked, switch off the flame to serve. 1) If you want this curry to be more spicy, you can replace Red chillies with 1 finely chopped green chilli. 2) You can also add finely chopped garlic while sauting onions according to your taste. 3) Adding 1 tbsp of Multi purpose Curry powder, enhances the taste also you can skip red chillies in this case.